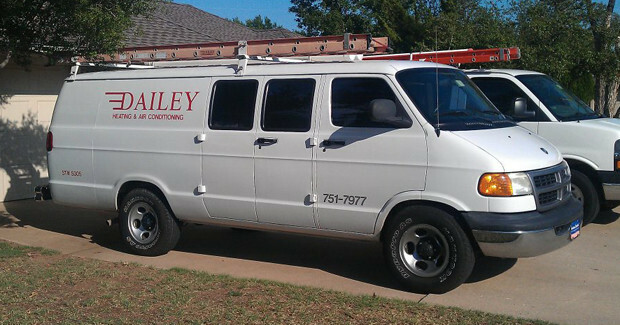 Family owned and operated since 1994, Dailey Heating & Air Conditioning has earned a solid reputation for providing high quality, timely and affordable heating and air conditioning services to the residents and businesses of Oklahoma City, OK and surrounding areas. We are a local, family-owned and operated small business in Oklahoma City, OK.
We offer a wide range of HVAC repair and maintenance services. We are endorsed by both the BBB and Angie’s List. Our HVAC service prices are among the best in town. In the event that your equipment needs servicing, you have the peace of mind knowing we’re only a phone call away. We provide you emergency service and free estimates for your systems. We can install or design any type of heating, cooling, or air filtration system that you require in your home or light commercial building. We install high-efficiency comfort systems designed to be the most cost-effective on the market and geared to your particular property. You can get 30 energy efficiency savings in offices up to 20,000 feet with new HVAC systems. Ask us about the latest technology for your particular needs. To save on utility bills and service calls, we urge you to take a preventive approach to heating and cooling. All of your heating and cooling systems should be included in a regular inspection and maintenance program. Also beware of Low priced “get your foot in the door” heating and air conditioning inspection ploys that lead the contractor to be tempted to deceptively sell unneeded services as a necessity to make up for foolishly low checkup prices that cannot recover the cost incurred for the service. We offer our services honestly, with financial prudence, while keeping our integrity intact, not with deception and loss of truthfulness. Please get in touch with Dailey Heating & Air Conditioning at (405) 751-7977 today for a free quote or use the link below to contact us online. Mention you found us online and take $12 off any service or repair!